June the 16th finally arrived and coincided with heavy rains and thunderstorms. 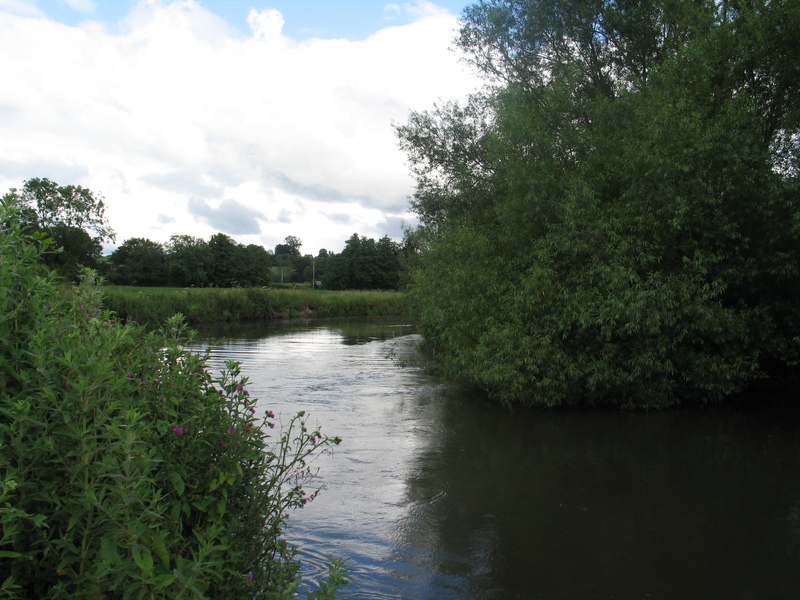 Some rivers were 2-3 feet up on normal summer levels and generally heavily coloured. The biggest worry is for the freshly laid spawn, so lets hope it doesn’t get washed away. 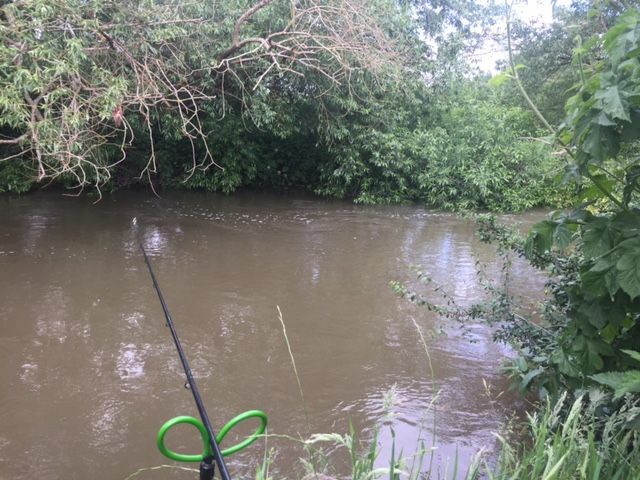 On the upside it does make for pretty good barbel conditions, as opposed to 30c and bright sunshine I guess. Geoff and I headed to a new stretch of river for the opening day and one that will see us through the remainder of the season, when we are not on the Wye or Trent. The levels were good, with the river carrying about an extra foot of coloured water. There was a really good flow. This particular stretch had loads of bankside cover, with lots of over hanging trees and bushes presenting plenty of cover for wary fish. We went for a quick recce and was presented with a delightful small river, with varying flows and depths. The whole stretch presented all sorts of opportunities to drop in and let a bait swing round in the current and under some form of feature or another. The time spent plumbing the depths provided information on some deep holes and deep gravel runs, which hopefully would prove fruitful. Depths varied from a couple of feet to as much as 7 or even 8 feet in places, even right under the nearside bank. The weather conditions today seemed perfect; overcast and warm. The forecast was for the occasional shower but we were keeping our fingers crossed for a dry day. We had to be off the water at sunset, which was around 9.15pm. I opted for a mouthwatering swim about 1/2 mile downstream. There was a tree down across the water to my right (upstream) and a huge leaf covered branch hanging across the river to my left. The nearside bank also had plenty of cover. A crease ran approximately halfway across the river and was created by the tree upstream of me. It looked perfect. At my feet the depth was 7ft and appeared to be mainly clean gravel. 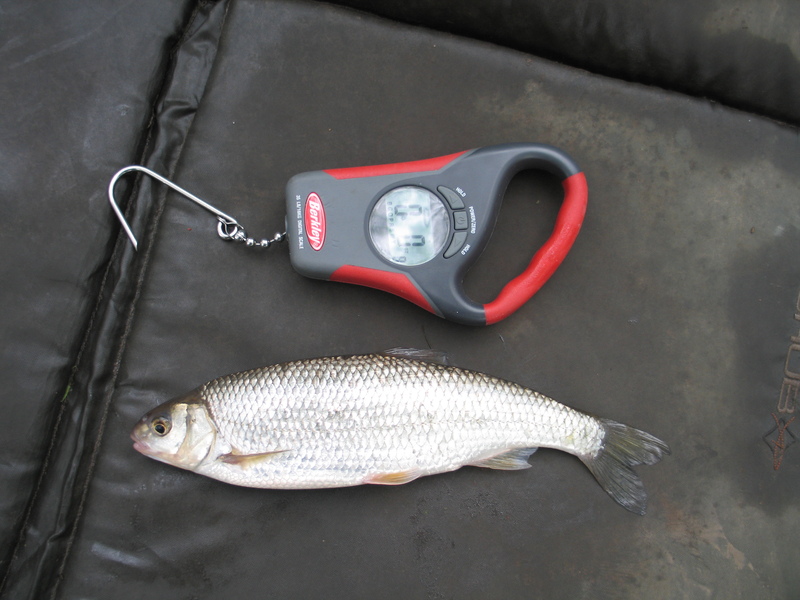 It had to produce a barbel! I fed some 6mm and 8mm caviar pellets into the swim whilst I set-up. 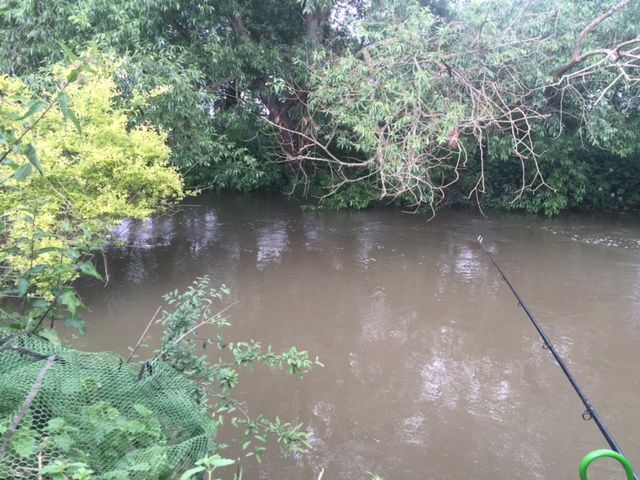 As this was a small river my Trefor West 1lb 12oz LA Barbel rod would be ideal. It has a sensitive tip and a soft action, well until a big fish is on and then it has masses of reserve power. They really are lovely rods to use for this kind of fishing. I matched this with a good quality Shimano reel, 10lb mainline and a coated braid hooklink. 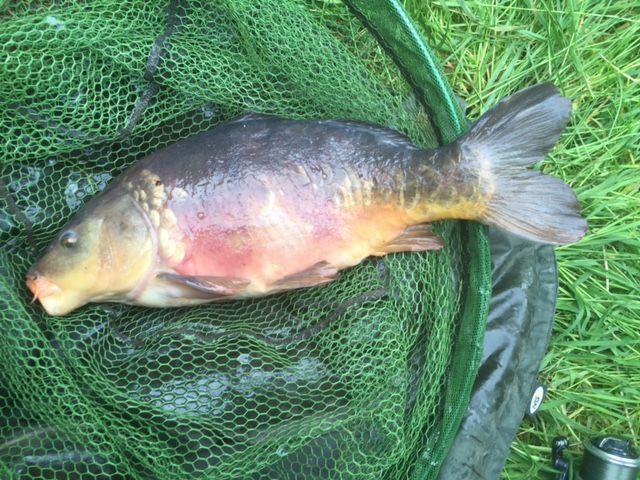 Bait was double caviar pellet to start. I had a number of options with me to fall back on if the pellets failed to produce, although they rarely do. 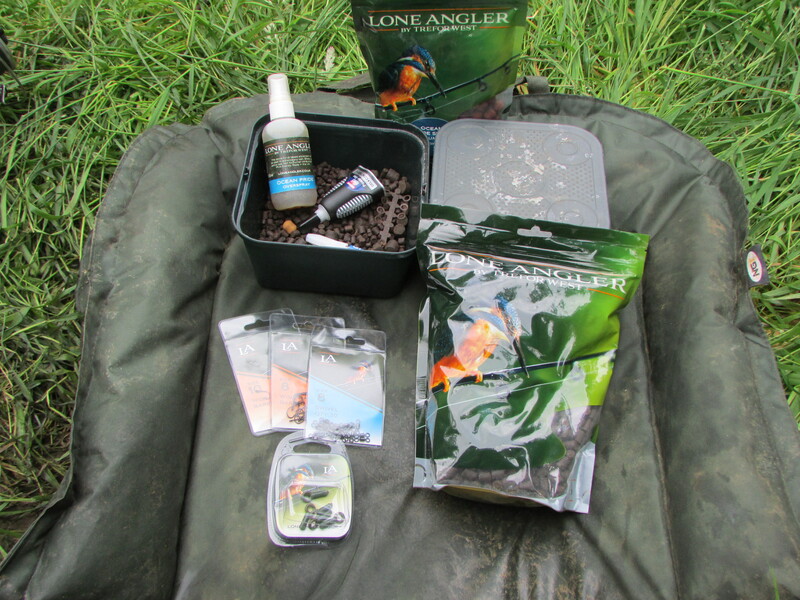 With a steady trickle of small pellets going in I chose to fish close to the bankside cover in the deep water. The flow here was reduced somewhat by the fallen tree upstream, so a small lead was sufficient. It didn’t take too long to get some interest, a few chubby knocks on the rod top indicated life. Soon the rod top was bouncing around and after quite a surprisingly spirited fight a nice chub was eventually landed. It was great to see such a lovely fish again after the 3 month break. Chub are perhaps my favorite fish and at 4lb 9oz it was a good start to the new campaign. The sun came out every now and again and almost roasted me. I was secretly hoping it would cloud over a bit more to keep from being BBQ’d! Sadly I got my wish later on. 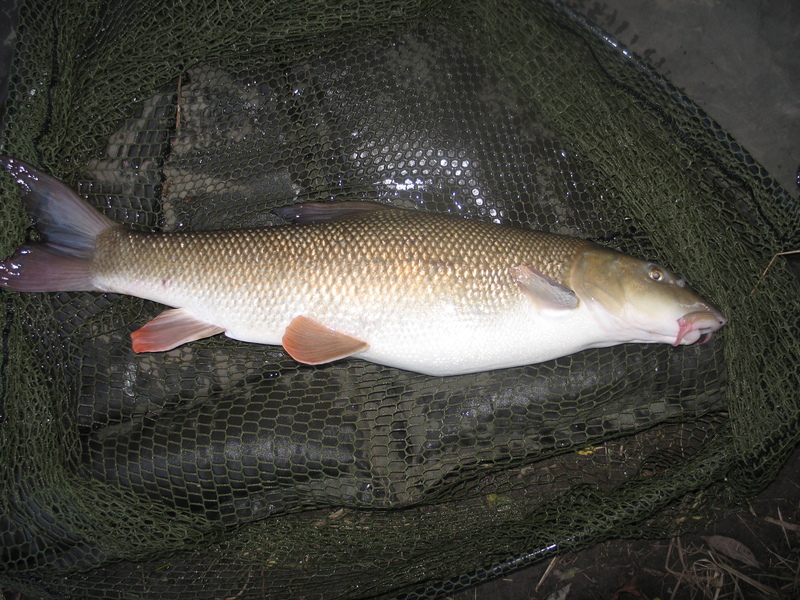 As the afternoon wore on into early evening the rod tip whacked round and at last I thought this had to be a barbel. The fish powered off to the middle of the river and then headed towards some sunken tree roots to my left. As good as this fish felt, my heart was telling me it wasn’t a barbel. 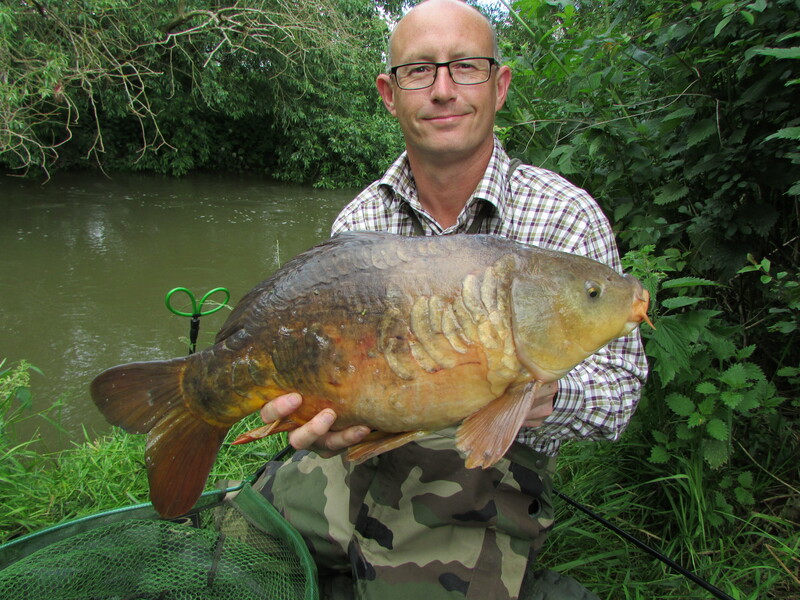 I was right but it was a stunning mirror carp that tipped the scales at 11lb 7oz. I was more than happy with a fish of that size and Geoff obliged with the camera. A little later on the rod tip slammed round again and this fish surged off as strongly as the last. Again it didn’t take long to realise this was probably another carp. It was, a fish of around 12lbs with a lovely hue of orange to it’s flanks. Geoff by now had moved down stream of me and had failed to entice a bite. I had decided to stay put as this swim just looked so perfect. I would normally move quite regularly but it seemed a good spot and perhaps I was feeling a bit lazy after a busy week at work. By now it was around 8pm and the clouds had started to build up, they were dark and foreboding. A few heavy rumbles of thunder resonated in the valley and a sudden flash of lightning illuminated the dark clouds. This was the witching hour and we were reluctant to pack up early, possibly missing our best opportunity for a barbel. The storm seemed to be moving away but as often happens in a valley, it was soon heading back as it swirled around overhead. A massive clap of thunder almost sent me into the river in surprise and a bolt of lightning headed earthbound. Still we stubbornly refused to go. However Geoff now reported rain downstream. I was still dry but felt it was best to call it a day. Just 10 minutes later the biggest clap of thunder I’ve heard in a while detonated directly overhead and the skies opened. The rain was torrential. It hammered down, with great blobs of rain splashing mud in all directions. Luckily I had already just about packed up. I threw on the rucksack, grabbed the rest of the gear and beat a hasty retreat to the protection of the dense tree cover. Despite the cover, I was soon soaked through and stood there sopping wet waiting for Geoff. He had quite a walk ahead of him but soon appeared. A bedraggled figure, dripping wet and looking thoroughly miserable. We were soon back at the car and heading home. It was an interesting start to the season. 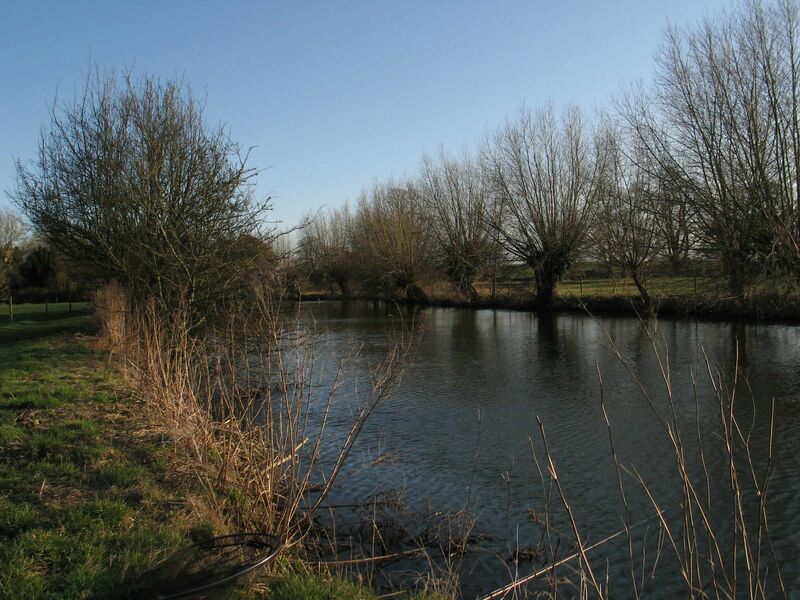 The stretch certainly looks good and probably will present some great opportunities for a mixed variety of fish. Hopefully next time a barbel or two will put in an appearance. After spending a few days on the Wye, it was time to head back to the Kennet for a couple of days. I started off with Geoff on a Newbury controlled stretch. It was a deep, heavily overgrown area. The top end was a little shallower but gradually deepened as it went downstream, ending up with 10-12 feet of water. The average seemed to be 6-8 feet. 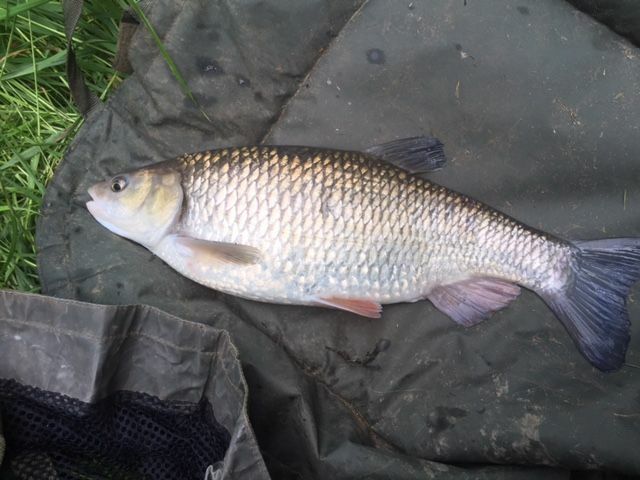 Despite finding some nice swims and managing to take a nice upper 4lb chub, very little else happened. 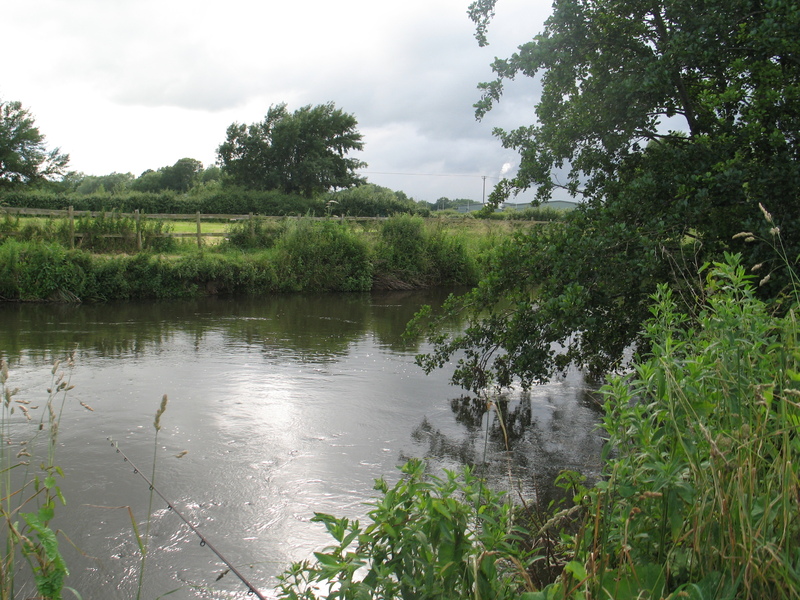 Personally I think that it’s a stretch that will come into it’s own from Autumn onwards, as the barbel look for deeper water. Geoff only managed a bream and so we packed up around midnight. We’ll definitely be back but not for a couple of months. 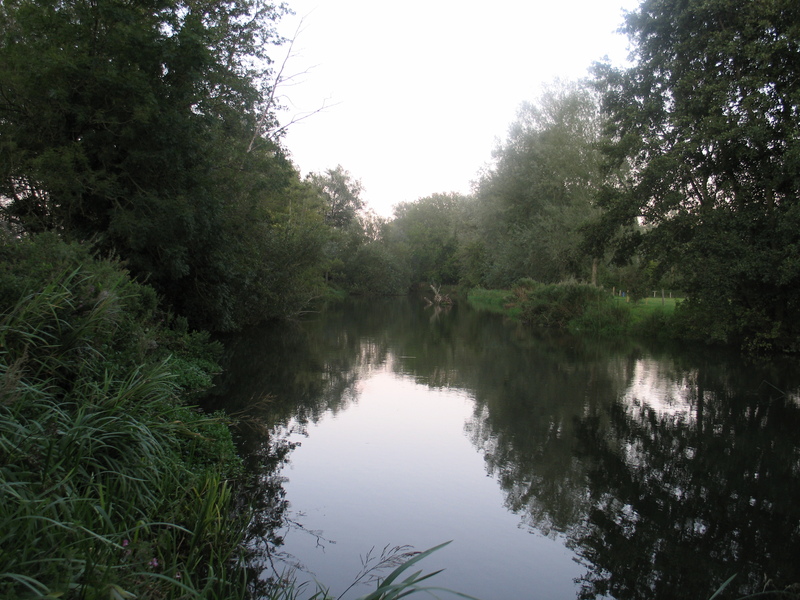 The following day I headed to a Reading section of the Kennet for the first time. I was due to meet Micky Holtom, owner of the Barbel Angler website, to hand over the Association of Barbel Fisher’s ‘Beast’ centrepin reel. Whilst there, Micky suggested we did a bit of rolling. I haven’t done this method for a couple of seasons and even when I did, it was with little aplomb, however I fancied giving it a go again. 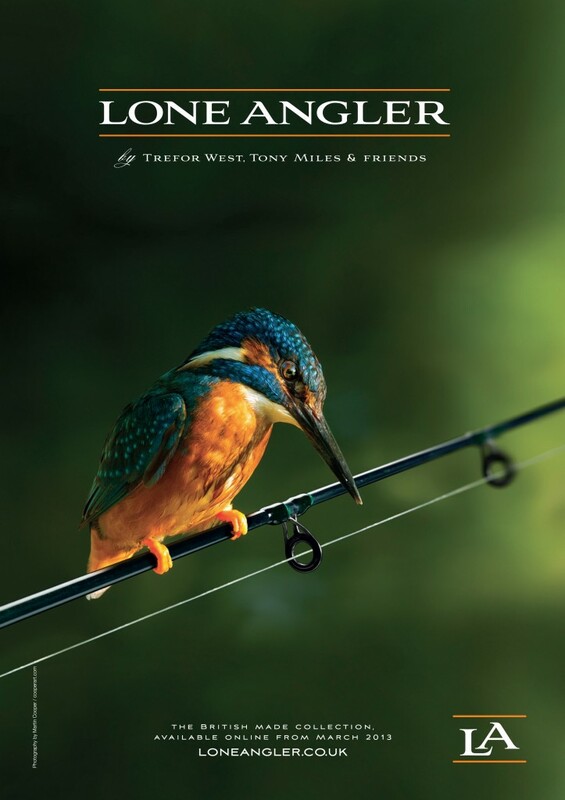 Without a doubt it’s a tricky method to get right and therefore plenty of practice is required to get a feel for fishing this method. Basically you fish a large lump of luncheon meat on a big hook (size 2) and if extra weight is required you can add a lump of plasticine 6-8 inches from the hook bait. You can add a little weight to the hook too. One way to do this was shown to me by rolling meat supremo Jez Brown. You mold a little extra heavy tungsten putty around the shank of the hook and then encapsulate it in some industrial type shrink tube. It works extremely well and I wished I had carried on with this method a couple of years a go, I might have been reasonable at it by now! One of the other reasons for giving up on it was the reel I was using. I opted for a fixed spool whereas the more accomplished meat rollers invariably use a Ray Walton rolling pin. This is a centrepin that can be turned so that the drum faces up the rod and then switched back to it’s normal position after casting. This means casting is easy and more importantly allowing line off the reel is efficient. You need to create a bow in the line so that the meat will trundle downstream along the bottom of the river, in a straight line. The use of braid allows you to quite literally feel the meat bouncing along the gravel. You then need to keep feeding line off of the pin to allow the bait to continue downstream in a free manner. When you feel a pluck, whack it. Often bites are quite delicate and I can clearly remember Jez saying that you often sense a bite rather than feel it. I can only concur with those sentiments, it’s hard to describe what you are striking at sometimes but you know its a fish. Anyway Micky lost a fish early on and then wandered downstream after showing me a hot peg to feeder fish. He soon phoned me to report that he had caught a couple of small barbel and a chub. I decided to wander downstream and join him for a while. He kindly allowed me to have another go. I found the main difficulty was getting the bow in the line right, so that I could feel the bait trundling along the gravel. I often felt nothing and therefore wasn’t in control. Still with a little guidance I eventually had a few knocks and one good one which I whacked. The fish was on but sadly not for long. Still it was a fish on, so I was doing something right. With more practice and the right equipment, I’m sure I’ll improve quite quickly and I’m really looking forward to another bash at this method. I returned to my swim for the remainder of the afternoon and evening. I was fishing a deep run under a tree. I started with a block end feeder filled with pellet. 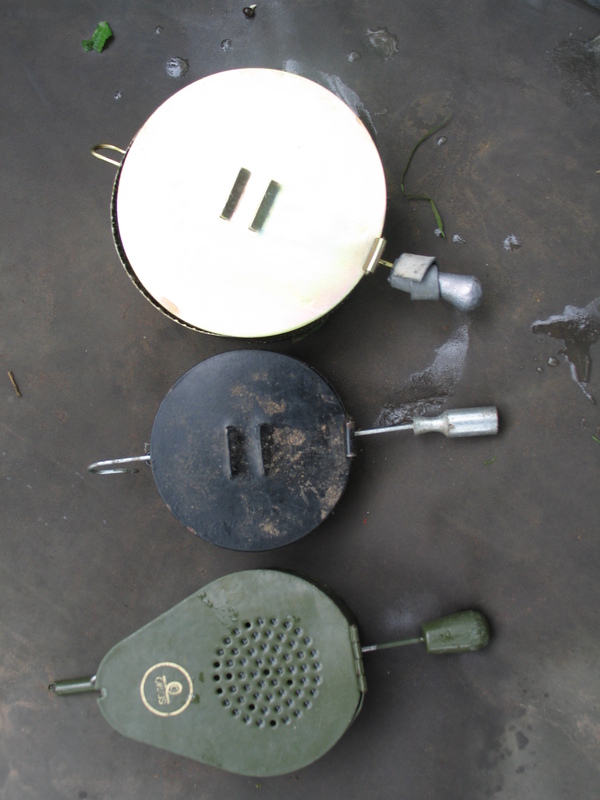 This is designed to just offer a scent trail rather than dump bait on the bottom. It’s a method that I have used many times and it has been very successful in the past. 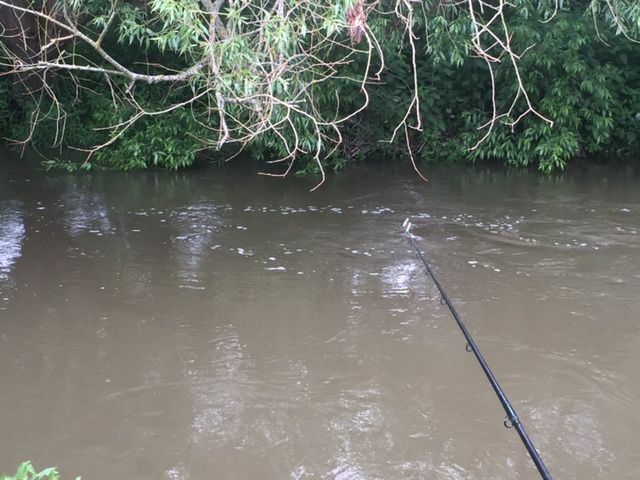 The idea is that the barbel pick up the scent trail and it triggers a feeding response, however the only bait there is the hookbait, so they don’t have a lot of choice in what they can eat. It’s not a method which everyone is convinced by and often people look at you like you’ve just been let out of the looney bin but it has worked extremely well for me on occasions, so there! 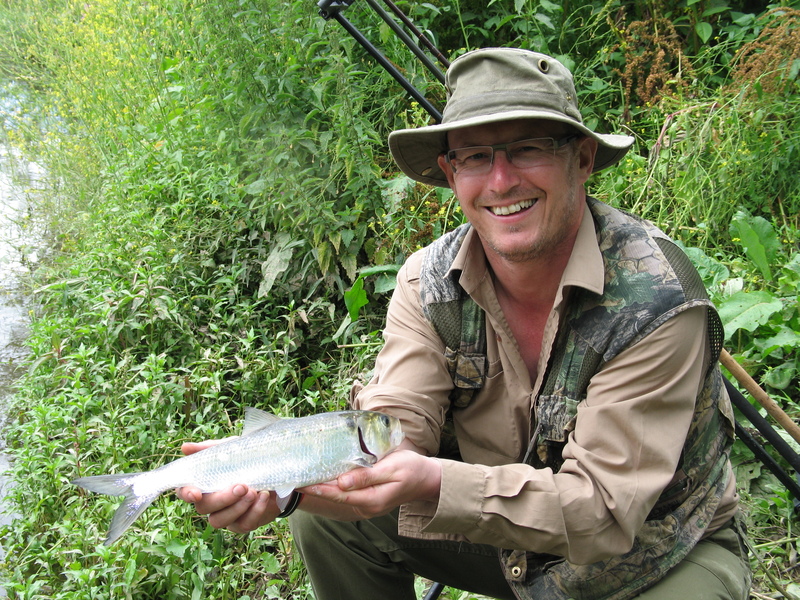 Anyway it wasn’t too long before the rod top slammed round and a feisty little barbel was scooped out. It was only about 4lbs but was my first Kennet fish of the season. Sometime later and the rod tip whacked round again. This time it was a slightly better fish of around 6lb+. During a quiet moment in between bites I glanced up for some reason (maybe a shadow caught my eye) and a beautiful barn owl swooped silently by, just above my head, with a mouse clutched firmly in its talons. What a stunning sight and just before that I watched a Kestrel swooping and hovering in the field opposite looking for a similar meal to the owl. I decided to call it a day about 9.45pm and headed home to Kent. Anyway, we had another trip planned to the upper Thames. It’s a spot I particularly like and still holds some stonking chub. 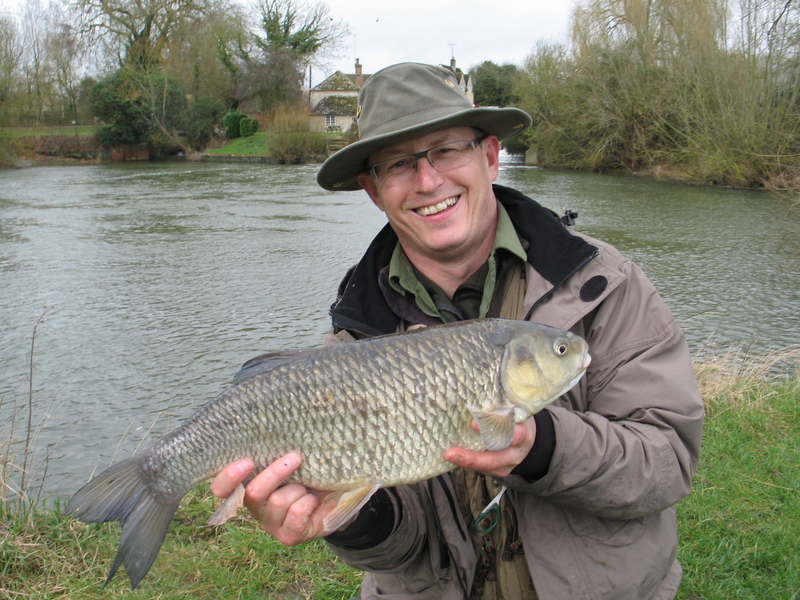 A couple of years ago John caught his Thames monster here, a magnificent chub of 7lb 2oz. So we know it still holds the potential to throw up a real whacker. My set-up is very simple. I fish 6lb line straight through to a size 6 hook. I slide on 2 Drennan Grippa Stops and then loop over a piece of line and attach the appropriate amount of shot that’s required to just hold bottom. I use the size 2 or 3 ssgs. I vary the distance from the hook but generally its 4 or 5 inches. If its really cold then it will be just a couple of inches from the hook. I then use a big piece of crust. The crust helps to balance the setup, so that it’s easy to move the bait with a twitch, in fact often the bait will move of its own accord. Once you have cast out, keep a nice bow in the line so that if the bait does move, it will travel downstream in a straight line and act far more naturally. We had another three days fishing planned in Wales but sadly the weather cut our trip short on the Friday. We had heavy rain, sleet and snow overnight Thursday and even during Friday morning and so we decided to head home early, after another hearty breakfast. We were glad we did because when we saw the river, it was very high and very coloured and would have been a waste of time. Still the two days prior to this provided us with some decent conditions. Sadly it was still bitterly cold with temperatures down to -6 to -8 overnight and barley above freezing during the day. Wednesday and Thursday saw us on the same stretch. The water was clear and had dropped a little since Monday. We wandered along the whole length of this section, exploring every opportunity. We found some cracking swims and over the 2 days caught quite a few decent grayling, topped off by a 2lb grayling for Geoff. We lost a few and I know Kevin lost several decent grayling. Most of the fish were around a pound and in lovely condition. Sadly the sub zero conditions made the fishing very tough. 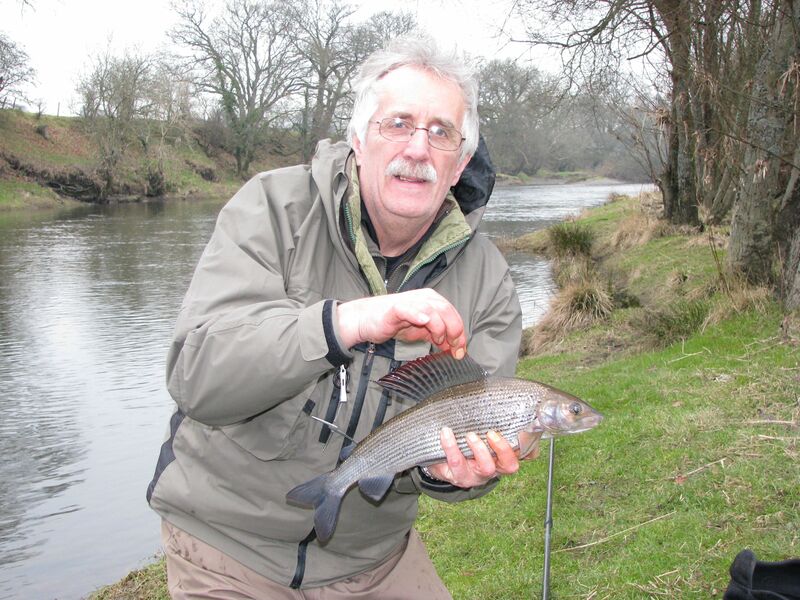 Still despite that, we caught about 90 grayling over these last 2 days. It will give us a few more ideas when we return in November. I must say that the Welsh people are very warm and friendly. You always get a wave and a hello from just about everyone. A rare thing here in the south east. So we know that wonderful and evocative song ‘we’ll keep a welcome in the hillside’ is quite heartfelt. 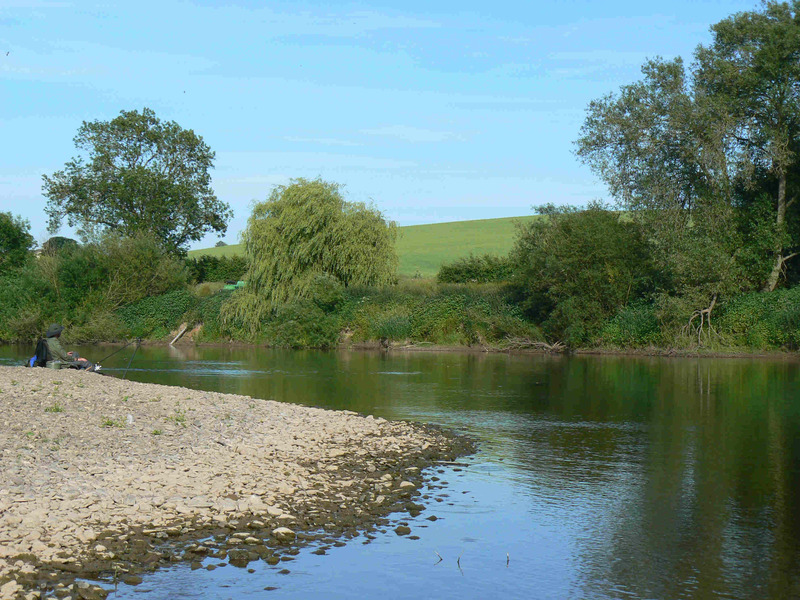 Spent a week during June on the banks of the Wye. It has become one of my favourite places to fish. Yes, it’s a prolific barbel and chub river, but for me its the stunning scenery and the river’s diversity that won me over so quickly. 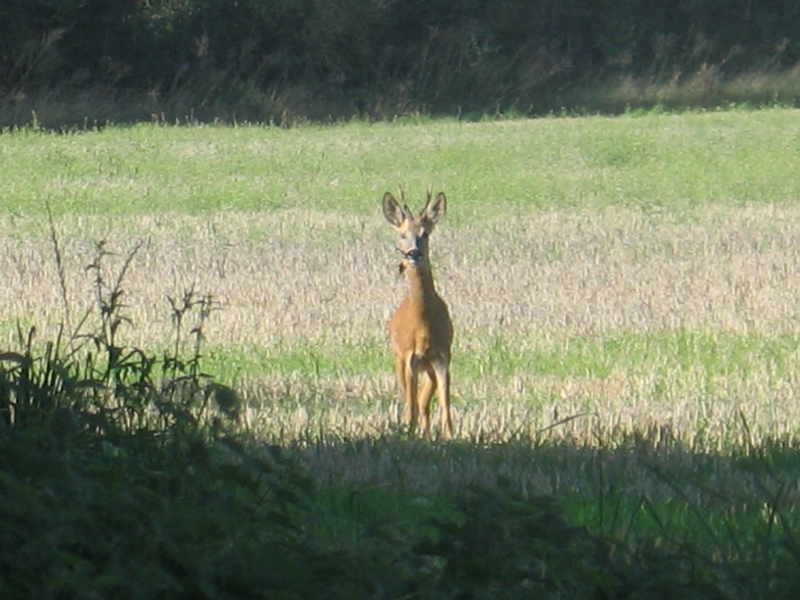 Staying at Whitehouse Farm (a caravan club certified site) opens up this area of the middle Wye. Being based near Foy means we can travel either up or downstream to find planty of beautiful, prolific stretches. 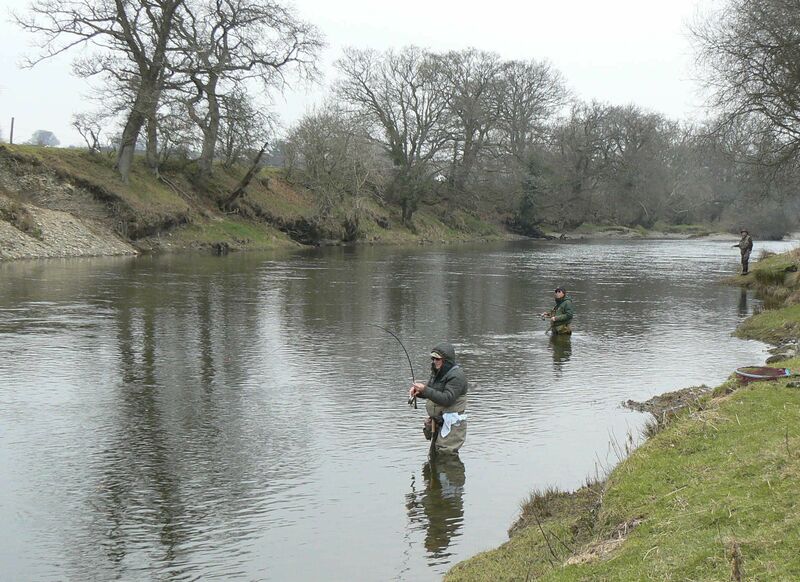 Whether they be member’s club waters, day ticket stretches or Wye and Usk controlled, there are plenty to choose from. We like to mix the week up with visits to all of the above mentioned stretches. 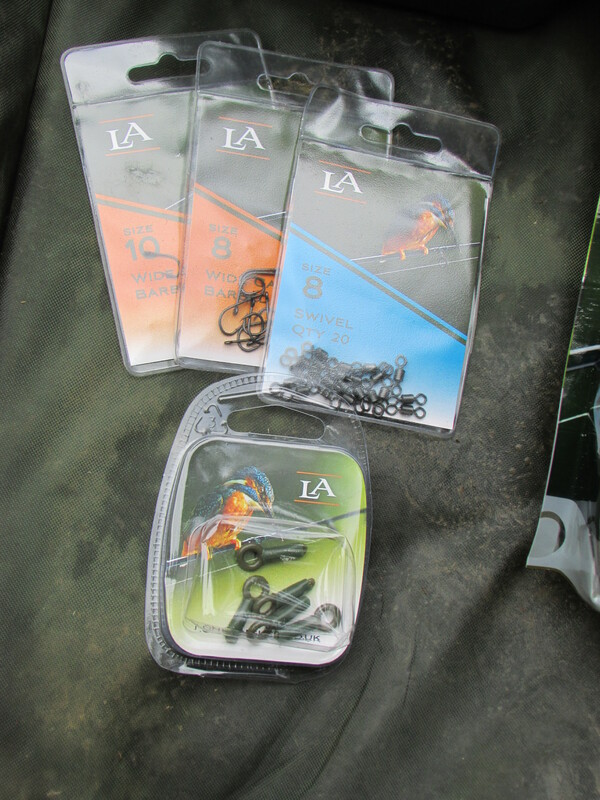 Being a member of Ross Angling Club gives me access to plenty of good river and at an affordable price. Next we target W&U as they offer limited numbers on their stretches, so you tend to get the place to yourself. Lastly we may go for the standard day ticket stretches and some of these can be very good. So after arriving to find the river several feet up and chocolate brown in colour we wondered what the week would bring. I have to say that the Wye does fish better with some extra water on, but I prefer it when the colour is dropping out a little and it’s not pushing through quite as hard. Still we were here and so gave it our best shot. We only fished a few hours but managed a few between us and we all caught which is nice. 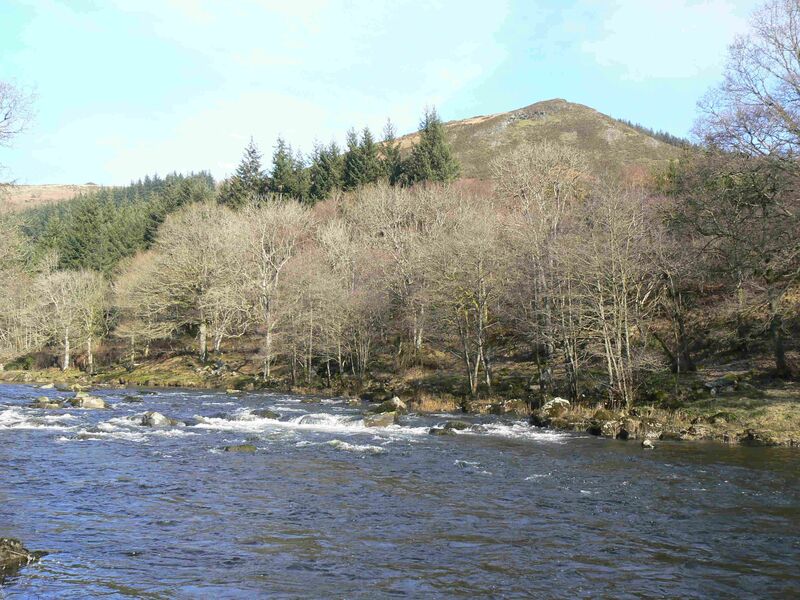 We hoped that for the second day the river may have dropped a little and the colour too. Sadly it seemed no different but the fishing was more productive. We ended up with about 20 barbel between the three of us. Sadly the session was cut short by the weather. A big thunderstorm moved in and I don’t do thunderstorms! As Freedie mercury would say “Thunderbolt and lightning – very very frightening….”. We then moved on to a Ross club stretch. It turned out to be a very attractive, tree lined section. I’m sure its one that deserves some further exploration. It looked quite varied in terms of depths and flow and on a return visit I hope we can wander more extensively. Still today we just targeted one area. The river was still quite coloured but the flow didn’t seem quite so pushy. 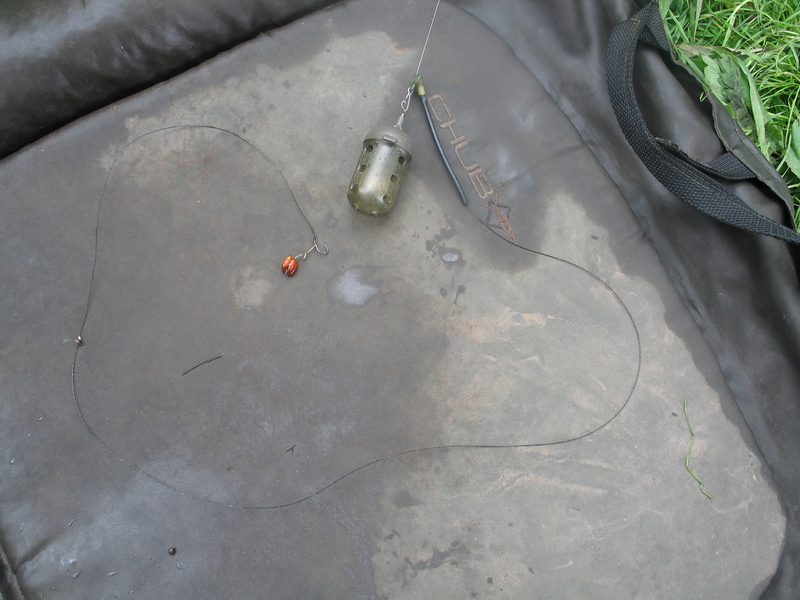 I fished a bigish cage feeder with Hinders barbel bomb and added mixed pellet. It’s a deadly combination in the right conditions. I use 2 superglued medium elips on the hair to finish it off. 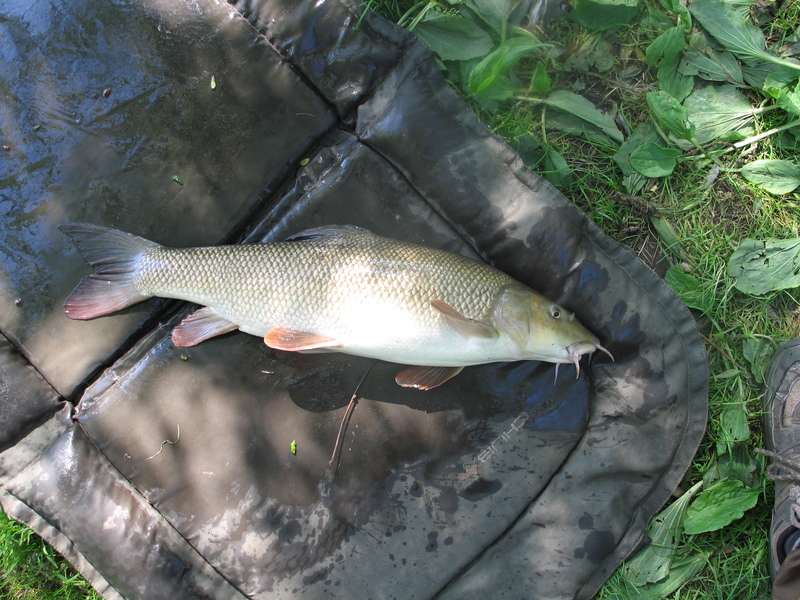 Today proved good for me as I ended up with 10 barbel to about 8lbs and 2 bonus shad. These are members of the herring family and fight like tigers. they were only small but boy have they got big mouths on em. They reminded me of Tarpon. We targeted a few W&U waters over the last 3 days. One was a new stretch for us and certainly one of the prettiest we have visited. It was in a lovely wooded valley. The scenery really was beautiful. The river appeared to be very weedy and so it was to prove. The fishing was tough. Well finding a clear spot was tough. We all ended up catching but lost a few in the weed. I had a great day taking 13 fish. Geoff and Kev caught a few too. The last two days were at a familiar stretch for us and we were joined by Dan. 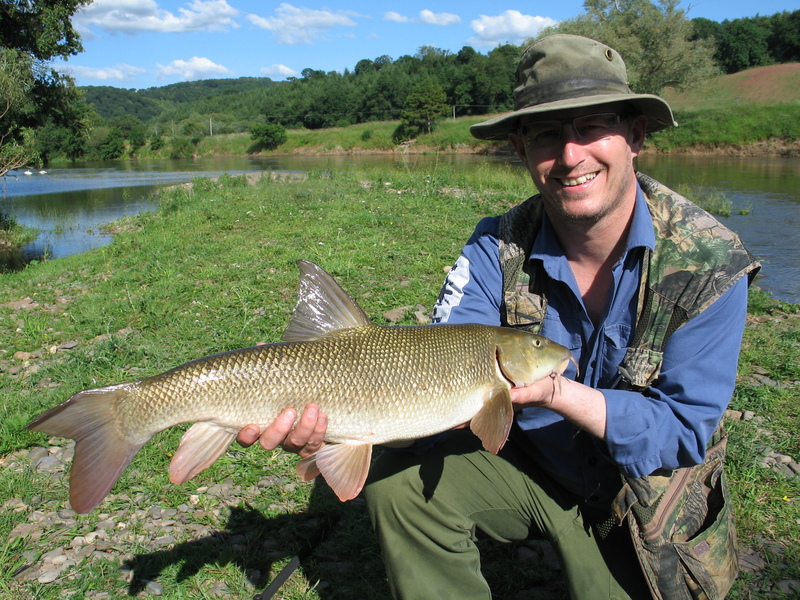 Over the next two days we caught in the region of 80 barbel. Great fishing in great surroundings and a wonderful end to an enjoyable week.